1. What are the main functions of blood? Blood is a means of substance transportation throughout the body. Blood distributes nutrients, oxygen, hormones, antibodies and cells specialized in defense to tissues and collects waste such as nitrogenous wastes and carbon dioxide from them. 2. What elements make up blood? Blood is made of a liquid and a cellular portion. The fluid part is called plasma and contains several substances, including proteins, lipids, carbohydrates and mineral salts. The cellular components of blood are also known as blood corpuscles and they include erythrocytes (red blood cells), leukocytes and platelets. Hematopoiesis is the formation of blood cells and the other elements that make up blood. 4. Where does hematopoiesis occur? Hematopoiesis occurs in the bone marrow (mainly within flat bones), where erythrocytes, leukocytes and platelets are made; and in lymphoid tissue, which is responsible for the maturation of leukocytes and which is found in the thymus, spleen and lymph nodes. 5. In which bones can bone marrow chiefly be found? Is bone marrow made of bone tissue? Bone marrow can mainly be found in the internal cavities of flat bones, such as vertebrae, the ribs, the shoulder blades, the sternum and the hips. Bone marrow is not made of bone tissue, although it is a connective tissue just like bone tissue. 6. What are blood stem cells? Stem cells are undifferentiated cells able to differentiate into other types of specialized cells. The stem cells of the bone marrow produce differentiated blood cells. Depending on stimuli from specific growth factors, stem cells are turned into red blood cells, leukocytes and megakaryocytes (the cells that form platelets). Research shows that the stem cells of the bone marrow can also differentiate into muscle, nervous and hepatic cells. 7. What are the other names for erythrocytes? What is the function of these cells? Erythrocytes are also known as red blood cells (RBCs) or red corpuscles. Red blood cells are responsible for transporting oxygen from the lungs to tissues. 8. What is the name of the molecule in red blood cells that transports oxygen? The respiratory pigment of red blood cells is called hemoglobin. 9. What is the molecular composition of hemoglobin? Does the functionality of hemoglobin as a protein depend on its tertiary or quaternary structure? Hemoglobin is a molecule made of four polypeptide chains, each bound to an iron-containing molecular group called a heme group. Therefore, the molecule contains four polypeptide chains and four heme groups. As a protein composed of polypeptide chains, the functionality of hemoglobin depends upon the integrity of its quaternary structure. 10. On average, what is the lifespan of a red blood cell? Where are they destroyed? Where do heme groups go after the destruction of hemoglobin molecules? On average, red blood cells live for around 120 days. The spleen is the main organ where old red blood cells are destroyed. During the destruction of red blood cells, the heme groups turn into bilirubin and this substance is then captured by the liver and later excreted to the bowels as a part of bile. 11. What are the functions of the spleen? Why can people still live after a total splenectomy (surgical removal of the spleen)? The spleen has many functions: it participates in the destruction of old red blood cells; in it specialized leukocytes are matured; it helps regenerate the hematopoietic tissue of bone marrow when necessary; and it can act as a sponge-like organ to retain or release blood into circulation. It is not impossible to live after a total splenectomy because none of the functions of the spleen are both vital and exclusive to this organ. 12. What is anemia? What are the four main types of anemia? Anemia is a low concentration of hemoglobin in the blood. The four main types of anemia are nutrient-deficiency anemia, anemia caused by blood loss, hemolytic anemia and aplastic anemia. Nutrient-deficiency anemia is caused by a dietary deficiency in fundamental nutrients necessary for the production or functioning of red blood cells, such as iron (iron deficiency anemia), vitamin B12 and folic acid. Anemia caused by blood loss occurs in hemorrhagic conditions or in diseases such as peptic ulcerations and hookworm disease. Hemolytic anemia is caused by the excessive destruction of red blood cells, for example, in diseases such as malaria or in hypervolemic conditions (excessive water in blood causing lysis of red blood cells). Aplastic anemia occurs from deficiencies in hematopoiesis and occurs when bone marrow is injured by cancer from other tissues (metastasis), by autoimmune diseases, by drug intoxication (such as sulfa drugs and anticonvulsants) or by chemical substances (such as benzene, insecticides, paints, herbicides and solvents in general). Some genetic diseases also affect bone marrow, causing aplastic anemia. 13. What is the difference between white and red blood cells? What are leukocytes? Red blood cells are called erythrocytes and white blood cells are called leukocytes. Leukocytes are cells specialized in the defense of the body against foreign agents and are part of the immune system. 14. What are the different types of leukocytes and how are they classified into granulocytes and agranulocytes? The types of leukocytes are lymphocytes, monocytes, neutrophils, eosinophils and basophils. Granulocytes are those with a cytoplasm that contains granules (when viewed under electron microscopy): neutrophils, eosinophils and basophils are granulocytes. Agranulocytes are the other leukocytes: lymphocytes and monocytes. 15. What is the generic function of leukocytes? What are leukocytosis and leukopenia? The generic function of leukocytes is to participate in the defense of the body against foreign agents that penetrate it or are produced inside the body. Leukocytosis and leukopenia are clinical conditions in which a blood sample contains an abnormal count of leukocytes. When the leukocyte count in a blood sample is above the normal level for the individual, it is called leukocytosis. When the leukocyte count is lower than the expected normal level, it is called leukopenia. The multiplication of these defense cells, leukocytosis, generally takes place when the body is suffering from infections or in cancer of these cells. A low count of these defense cells, or leukopenia, occurs when some diseases, such as AIDS, attack the cells or when immunosuppressive drugs are used. In general, the body uses leukocytosis as a defense reaction when it is facing infectious or pathogenic agents. The clinical condition of leukocytosis is therefore a sign of infection. Leukopenia occurs when there is a deficiency in the production (for example, in bone marrow diseases) or excessive destruction of leukocytes (for example, in the case of HIV infection). 16. What are the mechanisms to contain hemorrhage called? The physiological mechanisms to contain hemorrhage (one of them is blood clotting) are generically called hemostasis, or hemostatic processes. 17. How are platelets formed? What is the function of platelets? What are the clinical consequences of the condition known as thrombocytopenia? 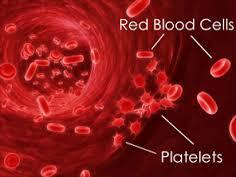 Platelets, also known as thrombocytes, are fragments of large bone marrow cells called megakaryocytes. Through their properties of aggregation and adhesiveness, they are directly involved in blood clotting as well as release substances that activate other hemostatic processes. Thrombocytopenia is a clinical condition in which the blood platelet count of an individual is lower than normal. In this situation, the person becomes susceptible to hemorrhages. 18. How does the body know that the coagulation process must begin? When tissue wound contains injury to a blood vessel, the platelets and endothelial cells of the wall of the damaged vessel release substances (platelet factors and tissue factors, respectively) that trigger the clotting process. 19. How can the blood coagulation (clotting) process be described? Blood clotting encompasses a sequence of chemical reactions whose products are enzymes that catalyze the subsequent reactions (that is why clotting reactions are called cascade reactions). In the plasma, thromboplastinogen transforms into thromboplastin, a reaction triggered by tissue and platelet factors released after injury to a blood vessel. Along with calcium ions, thromboplastin then catalyzes the transformation of prothrombin into thrombin. Thrombin then catalyzes a reaction that produces fibrin from fibrinogen. Fibrin, as an insoluble substance, forms a network that traps red blood cells and platelets, thus forming the blood clot and containing the hemorrhage. 20. What are clotting factors? Clotting factors are substances (enzymes, coenzymes, reagents) necessary for the clotting process to happen. In addition to the triggering factors and reagents already described (tissue and platelet factors, thromplastinogen, prothrombin, fibrinogen, calcium ions), other substances participate in the blood clotting process as clotting factors. One of these is factor VIII, the deficiency of which causes hemophilia A, and another is factor IX, the deficiency of which causes hemophilia B. 21. In what organ are most of the clotting factors produced? What is the role of vitamin K in blood coagulation? Most clotting factors are produced in the liver. Vitamin K participates in the activation of several clotting factors and is essential for the proper functioning of blood coagulation. 22. What is factor VIII? What is the genetic disease in which this factor is absent? Factor VIII has the function of activating factor X, which in turn is necessary for the transformation of prothrombin into thrombin during the clotting cascade. Hemophilia A is the X-linked genetic disease in which the individual does not produce factor VIII and as a result is more susceptible to severe hemorrhages. 23. How is hemophilia treated? Why is hemophilia rare in females? Hemophilia is medically treated with the administration of factor VIII, in the case of hemophilia A, or of factor IX, in the case of hemophilia B, by means of blood or fresh frozen plasma transfusions. Both hemophilia A or B are X-linked recessive diseases. For a girl to be hemophilic, it is necessary for both of her X chromosomes to be affected whereas boys, who have only one X chromosome, are more easily affected. A girl with only one affected chromosome does not present the disease, since the normal gene of the unaffected X chromosome produces the clotting factor. 24. What is the epidemiological association between hemophilia and HIV infection? Since hemophilic patients need frequent transfusions of clotting factors (VIII or IX) they are more susceptible to contamination by infectious agents present in the blood from which the transfused elements come. In the past, blood banks did not usually perform HIV detection tests and many hemophilic patients have become infected with the virus. 25. What are anticoagulants? What are the practical applications of anticoagulants, such as heparin, in Medicine? Anticoagulants are substances that block clotting reactions and therefore stop the coagulation process. Ordinarily, anticoagulants circulate in the plasma, since under normal conditions blood must be maintained fluid. In Medicine, anticoagulants such as heparin are used in surgeries in which tissue injuries caused by surgery act could trigger undesirable systemic blood clotting. They are also used to avoid the formation of thrombi inside the blood vessels of patients riskat an increased risk for thrombosis. 26. What is dicoumarol? What is the role of this substance in the clotting process and what are some examples of its toxicity? Dicoumarol is an anticoagulant drug. Due to its molecular structure, dicoumarol competes with vitamin K to bind to substrates, thus blocking the formation of clotting factors and interrupting the production of prothrombin. Dicoumarol is found in some decomposing vegetables and can cause severe internal hemorrhages when those vegetables are accidentally ingested. Coumarinic anticoagulants cannot be administered during pregnancy since they pass the placental barrier and can cause fetal hemorrhages. 27. Streptokinase is a substance used in the treatment of acute myocardial infarction. What is function of this substance? Substances known as fibrinolytics, such as streptokinase and urokinase, can destroy thrombi (clots formed inside blood vessels, capillaries or within the chambers of the heart) and are used in the treatment of obstructions of the coronary arteries or other blood vessels. Streptokinase destroys the fibrin network and as a result dissolves the thrombotic clot. Its name is derived from the bacteria that produce it, streptococci.